There are a number of pious legends which describe the origin of the Ladder Rosary, the most prominent being that of a vision had by Saint Francis de Sales. He saw two ladders rising up to the Heavens. One ladder was very steep and difficult to climb, while the second ladder was shorter and much safer, and represented help from Mary. St. Francis de Sales heard Jesus say, "Tell your people to come to Me by this ladder, by way of My Mother." The surest way to achieve closer union with Our Lord Jesus Christ is to go to Jesus through Mary, especially by means of recitation of the prayers of the Holy Rosary, and meditation upon the Mysteries. A "Ladder" Rosary is formed by attaching beads horizontally to lengths of chain, forming the "steps" of a ladder. This Rosary is also known as "Jacob's Ladder." St. Francis de Sales, a Doctor of the Church, used the imagery of ladders often throughout his works, and of Jacob’s ladder in particular, to deepen and enrich our understanding of his spirituality and of our humanity. "And he (Jacob) saw in his sleep a ladder standing upon the earth, and the top thereof touching heaven: the angels also of God ascending and descending by it; And the Lord leaning upon the ladder, saying to him: I am the Lord God of Abraham thy father, and the God of Isaac; the land, wherein thou sleepest, I will give to thee and to thy seed." We have used large gauge brass cable chain and different color metal findings for better illustration. Sterling parts which are handled regularly will not tarnish. We recommend using fine parts such as Sterling Silver or Pewter for a Rosary which can take up to three hours to complete. 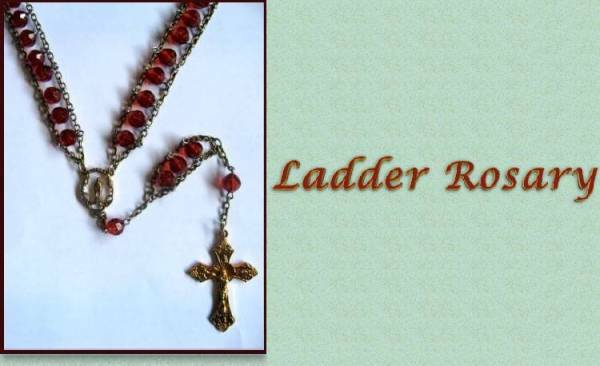 Ladder Rosaries are often created to commemorate a very special occasion. We glued 3 sheets of cardboard together to form a work board. While some prefer taping the chain to the cardboard, we will be using straight pins to anchor the chain; three sheets provide enough thickness to hold the pins firmly in place and keep them from poking through the other side. Our Work Board measures 6 x 14 inches. Your cardboard should be stiff enough to support the weight of the beads and chain and hold pins or tape in place while you work. You will need 59 beads, 6 or 8 mm. 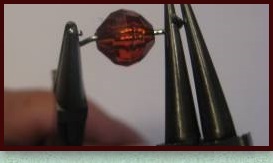 Eye pins to fit your bead size - You should be familiar and well-experienced working with eye pins. Jump Rings - You should be familiar and well-experienced working with jump rings. Ball-Tip Straight Pins, or Tape - Painters Tape works well and can be removed easily. The decades of Mater Beads are attached horizontally between two lengths of chain, beginning with the left side. 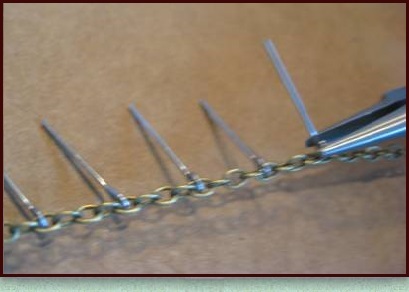 Grasp one end of the chain with your fingers to straighten it; no tangles and all links going in the same direction. Keeping the chain as flat and straight as possible, lay the chain on the work board. At the top left end of the work board, attach chain with a straight pin, or tape securely. Count down 5 links and mark with straight pin. 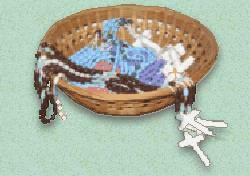 The next or 6th link will be the starting point for your first bead. Secure the chain with more pins at various points, down to the bottom of the board. 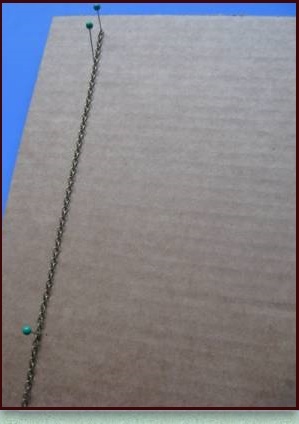 It is important to keep the chain as flat and straight as possible or the Rosary will not hang straight. On a regular Chain Rosary, eye pins are turned so that the loops are perpendicular to each other. With the Ladder Rosary, the loops will be turned parallel to each other. That is, facing each other on the same parallel plane, as shown above. Use your Flat Nose Pliers in a vertical hold to firmly grasp the left eye pin loop; use your Rosary Pliers or Round Tip Pliers to turn the right side of the eye pin into a semi-closed circle, as shown above left. Your loops should face each other on the same vertical plane. Count out ten eye pins. Open the loop slightly, enough to be able to pass a link of chain through. Work with 10 pins at a time to easily keep track of your count. 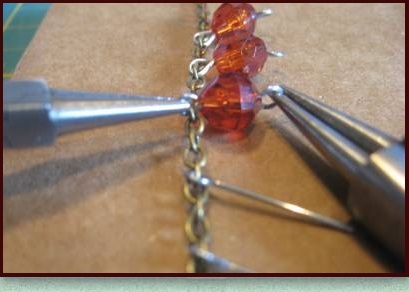 Count down to the 6th link from the end of the pinned chain and attach the first eye pin. 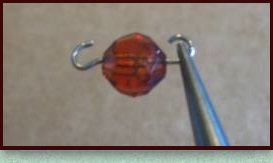 Slip the opened loop of the eye pin around the link. Carefully close the loop. 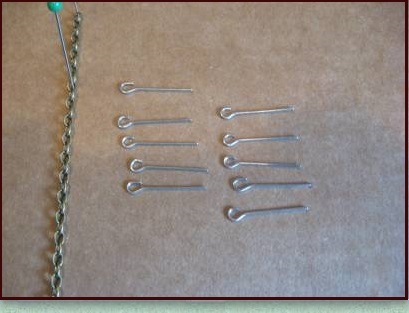 Count down 4 more chain links: attach an eye pin to the link. Proceed to add a total of 10 eye pins to every 4th link. Check and re-check that the eye pins are each 4 links apart. Begin adding a bead to each eye pin. Hold the left closed eye pin loop with your Flat Nose Pliers and turn the right loop, on the same plane as shown above, to partially close the loop, leaving it open enough to slip a link of chain through. Close all ten bead loops in this same way. Check that your chain is still taut and straight, re-pinning straight pins as needed. 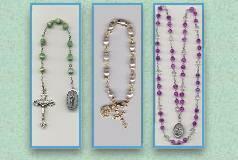 At this point, you must decide which style you will use to attach your Pater beads. There are three different style from which to choose.